On The House midweek podcast, Sarada Peri, former senior speechwriter to Barack Obama, and Ryerson Leadership Lab's Karim Bardeesy discuss safeguarding democracy in the face of election interference and the playbook of populism. 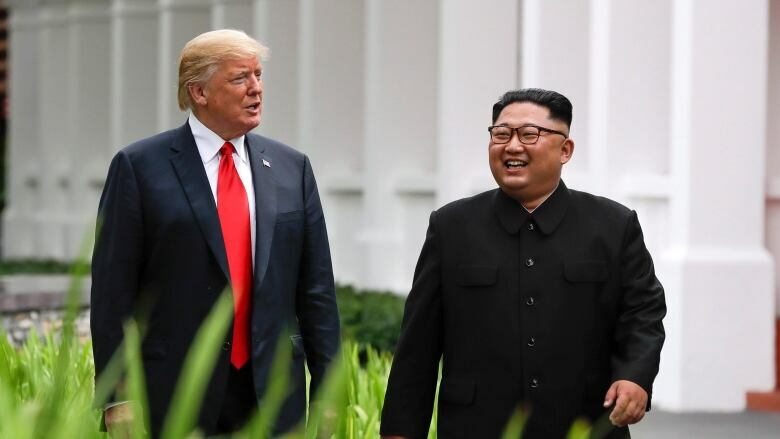 Then, former diplomat James Trottier, who led four Canadian diplomatic missions to North Korea, analyzes the differences between a U.S. intelligence assessment on the country's nuclear arsenal and President Donald Trump's assertions. The federal government announced its plan to fight election meddling and safeguard the country's democratic process Wednesday. The strategy will include an internal team tasked with sounding the alarm if it sees evidence the October federal election is being undermined. It's a problem countries around the world are grappling with in the wake of allegations of interference in the 2016 U.S. presidential election and the Brexit vote in the United Kingdom. On The House midweek podcast, Sarada Peri, former senior speechwriter to Barack Obama, and Ryerson Leadership Lab's Karim Bardeesy discuss safeguarding democracy in the face of election interference. "I think we had that going on in the States for quite some time, that people were losing trust in the media, in their elected officials," said Peri. "But it wasn't until the election in 2016 that we started understanding what that would mean." Both Peri and Bardeesy agreed that protecting democratic institutions can't be left to social media companies on their own. "I'm not sure we can trust Facebook to be the arbiters of what is true and false [online]," said Peri. "It cannot be something we just leave to their own devices." "It's not natural to their business model, so they have to realize their ability to depend on the public trust depends on them being very aggressive on this," said Bardeesy. Then, former diplomat James Trottier, who led four Canadian diplomatic missions to North Korea, analyzes the differences between a U.S. intelligence assessment this week of Pyongyang's nuclear arsenal and President Donald Trump's dismissal of that threat. U.S. Director of National Intelligence Dan Coats and CIA Director Gina Haspel told senators Tuesday that North Korea views its nuclear program as vital to its survival and is unlikely to give it up. U.S. spy chiefs contradict Trump on what threatens U.S. In a Twitter post, Trump said the "North Korea relationship is best it has ever been with U.S." and added there is a "decent chance of denuclearization." Trottier said he believes the president is "desperate for a deal and Kim Jong Un knows it." "U.S. and North Korean negotiators have reached an impasse because of their differing interpretations of denuclearization, and Kim Jong Un has decided it's better for him to have a summit with Donald Trump and try to get what he wants directly from the U.S. president, because he's not getting it from the diplomatic and intelligence communities in the U.S.," said Trottier. Trump and Kim are expected to sit down for a second summit, likely in Singapore at the end of February. In the meantime, Trottier said, Canada should be realistic about the chances of progress on denuclearization. "It's important for Canada to give some serious thought to the fact that North Korea is a de facto nuclear state and will remain so, despite our wish."